Marianne Droney started singing in the chorus when she was in third grade and, aside from a brief hiatus in the late eighties, hasn’t stopped since. An accomplished alto vocalist with over twenty five years experience performing with community, church, and chamber chorales, she is delighted to have been a member of Areté since its inception in 2009. She has previously sung in ensembles such as the San Fernando Valley Master Chorale, the Premiere Chamber Chorale, and the CSUN Women’s Chorus. Currently she is also a member of the Los Robles Master Chorale, which she joined in 1998, and the New West Symphony Chorus. She has enjoyed performing the great choral masterworks such as the Verdi Requiem, Bach’s Mass in B Minor, and the Brahms Liebeslieder Waltzes, as well as contemporary works by David Lang, Morten Lauridsen, and Shawn Kirchner. Her experience as a chorister has led her to performances in cities as diverse as Honolulu, New York City, and Helsinki. 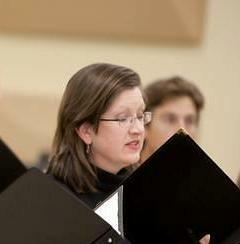 Best of all, choral music introduced her to the love of her life, her husband Kevin.